Pierce has been really into Legos since last summer (he even spent a week at Lego camp). He's been fortunate to receive some nice sets from friends and family. The most important thing about Legos is to keep the sets together and whole, and to save the instructions. Because once you lose some key pieces, it just isn't very fun anymore. You can buy these really neat Lego storage systems, but they are very expensive and certainly not in our budget. So I came up with my own method for controlling the Lego madness. The smaller sets work well in the $1 shoebox containers from Dollar Tree. I cut up the Lego box and tape the picture of the set to the top. And then I also tape a smaller picture to the side, since we stack the boxes in Pierce's closet. This makes it very easy to find the set you need. 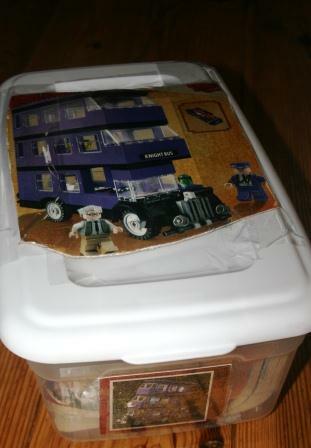 Some of the larger Lego sets do require larger tupperwares, but most of the sets we have are smaller sets that work well in the small tupperwares. It's a system that has worked well for us so far. How about you, readers? Are you organizing any Legos in your house? I just love Legos !!!! Happy building guys ! I remember having 4 kids in the house and you COULD NOT walk anywhere safely at night without shoes due to the LEGO minefield. Such a perfect solution for this old favorite! This is a great way to organize them. My nephews used to dump all the Legos from all the sets into one bin and couldn't find any of the right pieces. You are so organized and inspiring! Great idea! This is a good idea. Ben likes to save the whole box. So I put the peices back in the box -tape the box to keep it from falling apart. Put all these boxes in a large tote box and put that in his closet. Legos are wonderful ! I use plastic bins for EVERYTHING!! You are making me want to go home and clean out my closets!. We have Legos for when the grandkids are here. Great storage idea. Organization can be key. Now that is a GREAT organizational idea!! Such a great and easy way to store the Legos and be able to find them! That's a great idea. The Chinese Restaurant we frequent, the owner's little boy got new Legos for Christmas and gave us a demo!! Our 3 are just starting to really get into the Legos in the last year--it's a little chaotic! :) So far we've given each of them a tub (probably about the size of 2 plastic shoe boxes) to keep them in and then we sort the individual sets into ziploc bags with the directions and a cut out from the box. The nice thing about the slightly bigger tubs is that they can keep some smaller things in the tub already built. Great idea, Lisa. Hunter got some for Christmas; I need to find those storage bins. Thanks for the tip! Invested in clear plastic rolling bins, but it's a MESS in the Lego room. Oh well, their mess, not mine! I love Legos-such a classic! Sure - NOW YOU TELL ME - thousands of legos late!!!!!!!!!!!!!!!! We do this for our sets too, the problem being that all the boxes are empty because once they build them, they want to display them! LOL!! That's a great idea. I remember my son had dresser drawers full of Legos. So simple, yet brilliant! I have only one or two tiny sets and keep them in Ziploc bags. I do not have any legos in my house, but I'd imagine for the mothers that do, your solution is very much appreciated. You have some mad organizational skills! oh boy, do I remember Legos, so much fun but you are right about loosing a piece! Thank you for sharing this tip. I have to pass this on to my daughter. Pooh Bear has tons of legos. 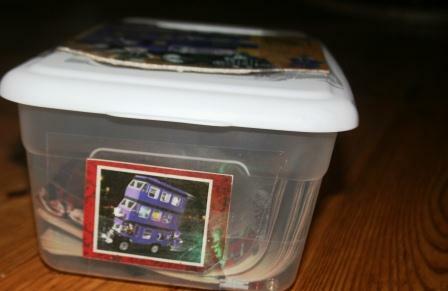 I just have them all in a big tub...but the instructions are saved too...so there is room for free play and the kits. That said, my kids are older and the kits weren't as elaborate as they are now. My 20 year old just told me he misses playing with Legos. Can I send him over? Exactly how we do it...except for the oddball legos that seem to end up on the floor, for me to step on. Great idea. Legos are trying to destroy my life so this might just save me :) thanks! So far my daughter has 3 small sets -- all stored in one of my not often used Tupperware containers with the booklets of instructions. I am definitely going to have to find a different solution when her brother starts with Legos, too!